Skyview Stud's quest to breed a line of tall (16hh and over), dilute performance horses with versatility has come after many years of dreaming, learning, research, homework and "consulting with the experts". Fortunately, over the past 10 years, understanding of the inheritance of coat colour in horses has become much more widespread, including the advent of genetic testing to determine what colour genes (genotype) a sire and dam carry, and therefore are likely to pass on to their foals. As little as 8 years ago, studs around the world that bred foals with two cream genes (known as double dilutes) would seriously consider and potentially destroy the resultant cremello (chestnut based) and perlino (black/brown/bay based) foals, as until recently palomino breeders were under the belief that the could produce a "pure" breed if they used enough generations of palomino to palomino breeding. In Australia, cremellos were not able to be registered with the palomino societies, so they were "worthless" as breeding stock until around 2000 when the inheritance of coat colour was better understood, and the Breed Societies finally started opening their books to allow cremellos to be registered. Fortunately, thanks to the great work and theories put forward by Jeanette Gower and others working in this area we now have a much better idea of how these genes are inherited and work to dilute chestnut to palomino, and black/bay/brown to buckskin. 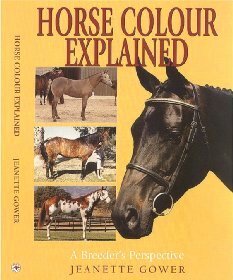 For those who haven't read it, I would highly recommend Jeanette's book "Horse Colour Explained" (2000), and it can be obtained directly from the author via this link www.chalani.net/hce . As always, this book is theoretical and has been a point of much discussion. For further ongoing information the following web site is also an excellent source and written by Australian Geneticist, Glynis Giddings, at www.horse-genetics.com. "Never breed with a badly conformed or bad tempered horse just because of its colour." Hopefully over the next 5 - 10 years we will see an increase in the number of dilute horses produced that are of good enough quality to compete openly, in the show and performance rings, like the Champagne Charlies, Chico d'Oros, Baileys on Ice and Peaches and Cream that went before them. Let's hope so !